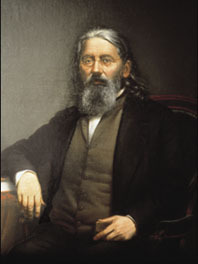 A Prussian immigrant Constantine Hering is usually considered the father of American homeopathy. What is not known about him, that his ancestors actually came from Moravia and their original surname was written as ‘Hrinka,’ as his daughter had written in his biography. They were likely post-White Mountain religious refugees, because Hering’s uncle grew up in a religious family and initially thought of becoming an Evangelical preacher. Constantine Hering was born on January 1, 1880 in a small town Oschatz (Ošice, in Czech). He gained his basic medical education at the Surgical Academy in Dresden and then at Leipzig University. During his stay at Leipzig University, he was an assistant of Dr. J. H. Robbi, a former surgeon in Napoleon Army, who was a dogged opponent of homeopathy. The Leipzig publisher C. Baumgartner was interested in publishing a book, in which the homeopathic ‘heresy’ was, once and for all, disproved because it greatly annoyed regular physicians. Dr. Robbi, to whom he first turned, for lack of time, referred him to his assistant Hering, who took charge of the task with delight. However, during the study of the writings of Samuel Hahnemann, the European representative of homeopathy, Hering discovered, in a series of experiments which he performed on himself, that Hahnemann’s claims were correct. To his doubts also contributed his own experience, namely, when he injured his hand during autopsy and his wound got badly infected. The physicians recommended that he ought to have his finger amputated. Instead, he undertook a treatment, using homeopathically processed medicinal drug Arsenicum album, as a result of which the hand was cured and his finger saved. Hering subsequently changed his view about homeopathy and his own experience provoked even greater interest in the study of homeopathy. Instead of publishing a negative testimony about homeopathy, he refused to write the book. At the end, he himself became a propagator of this alternative way of treatment. He did not finish Leipzig University and left to Wűrzburg, where he thought the medical education was more progressive. For his Doctorate work he chose as a theme ‘De medicina future,’ in which he proved that the future development of medicine cannot be bypassed without the application of methods, advocated by Samuel Hahnemann. He defended his thesis with success and, in 1826, he received Doctorate in medicine, surgery and obstetrics, with the highest honors. After completion of his studies he became a teacher of mathematics and natural sciences at Dresden Academy. The University Rector suggested to him that they will send him on a research tour to South America, especially to Surinam, under the protection of the King of Saxony himself. Hering accepted the offer and then lived in Surinam for six years, where, besides his research, he also practiced homeopathy among the Moravian missionaries and the settlers. Simultaneously, he kept sending regular reports about his homeopathic research to homeopathic periodical Homeopathic Archives. That way he got into a conflict with the King’s physician, who was Hahnemann’s antagonist. 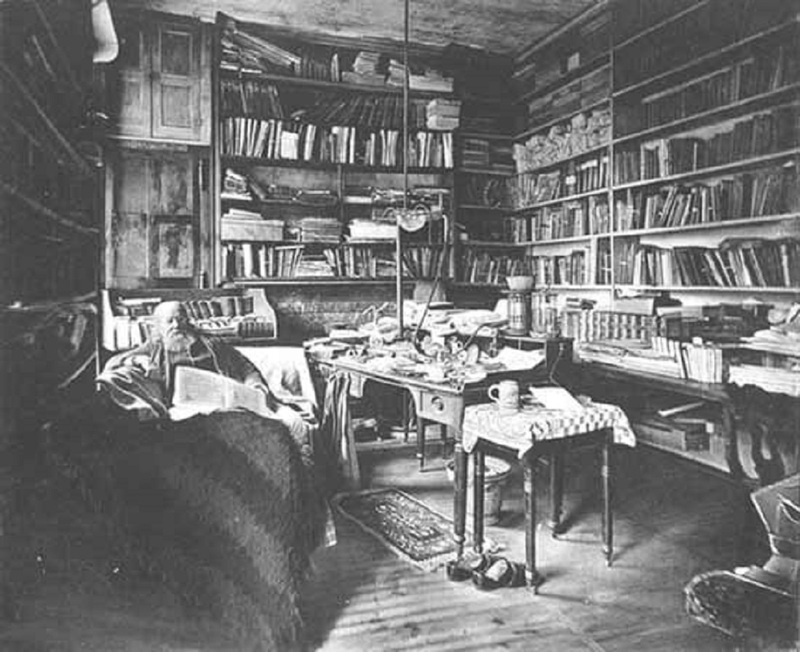 Thereupon he was given a notification that he ought to fully devote himself to zoological and botanical research and avoid writing offensive reports, which outraged Hering so much that he suspended all his commitments in Saxony. 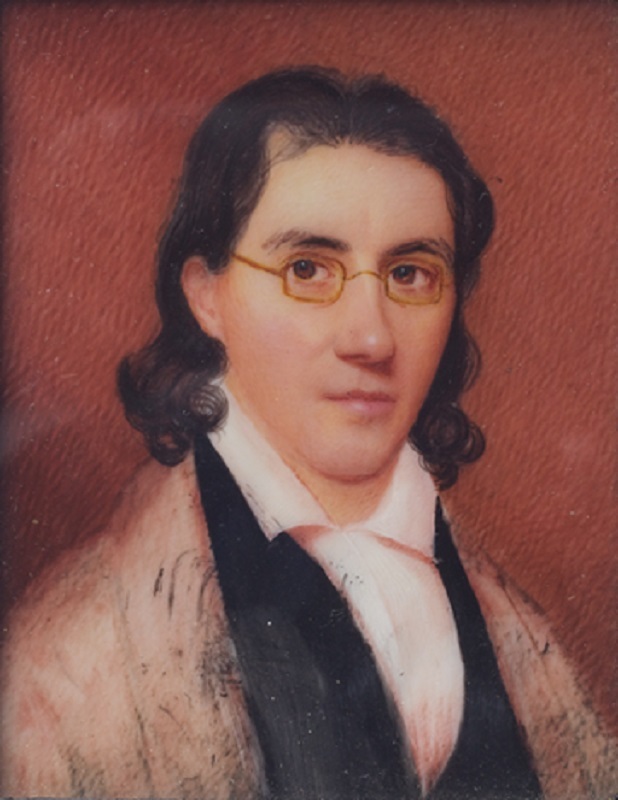 He was led to it also by news, which he got from his friend George Bute, a Moravian Brethren missionary from Bethlehem, PA, that in Philadelphia was founded a new Academy of Natural Sciences, whose member was a renowned Moravian mycologist Rev. Schweinitz. This prompted Hering to send his collections to the Philadelphia Academy. As a consequence, Hering became also a corresponding member of the Academy. After his resignation, he became a residence physician of the Surinam Governor in the capital city of Paramaribo. He devoted all his free time to finding new homeopathic medicinal preparations, about which he regularly informed Hahnemann in Paris and which he published in Germany. While in Surinam, he began his historical studies of snakes, including the Lachesis trigonocephalus or South American Surukuku, a specimen of which he deposited in the museum of the Academy of Natural Sciences in Philadelphia. This serpent he captured after much difficulty and danger, one of his Arrowackian Indian helpers being bitten. It was here he first used radiant heat as an antidote to the poison of the serpent, since which time it has been acknowledged to be an antidote to bites and stings of poisonous reptiles. Hering attempted to find a better substitute for vaccination against smallpox, which Jenner was developing in England. Hering thought that vaccination was very dangerous and from homeopathic point of view, ponderous. 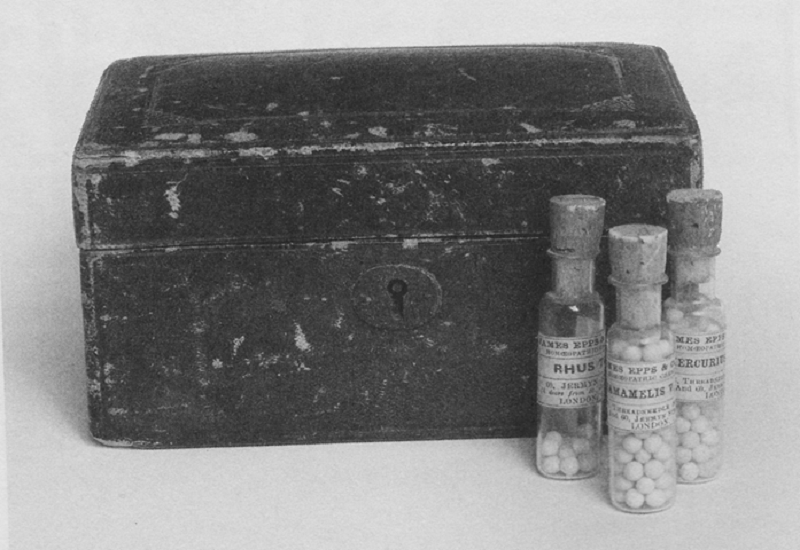 His interest for snake medicines and experiences with them, led him to the assumption that saliva from a rabid dog or ground dried scabs from smallpox, or any other products of diseases, viruses or poisons can be prepared by a new, Hahnemann-way and offer the treatment that would not fail. This way, Hering became, unwittingly, the first isopathic homeopath. In 1833, he decided to visit his native home in Europe, and on the way he stopped in Philadelphia to aid with the founding of homeopathy. His journey was opened up by miraculous curing of his friend G. Bute’s cholera. His fame soon spread and the local doctors began immediately experiment with his new medical method. Hering later decided to remain in Pennsylvania. 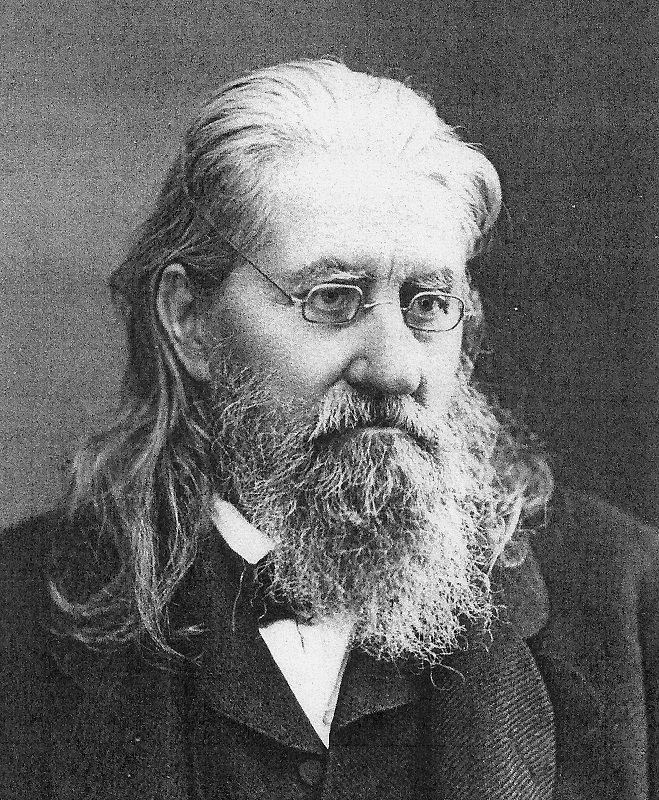 Hering was one of the first pioneers of homeopathy in the US. Besides propagating this alternative method, he is credited with the founding of university-based homeopathic school, the first of its kind in America. From 1845 till 1869, he occupied the chairs in medical institutions and Materia medica at the Philadelphia College of Homeopathy. He and his students treated over 50,000 patients annually and trained 3,500 homeopaths. Hering is highly credited for the expansion of Hahnemann’s theory of homeopathy. The basic idea of homeopathy is, of course, old, at least 2,500 years. It was mentioned already by the ‘Father of Medicine’, the Greek physician Hippocrates, but, as a medical treatment, homeopathy disseminated only in the last two centuries. Homeopaths believe that robust health comes from a balance between the mind and body. Homeopathy considers the pathological symptoms but pays equal importance to psychological symptoms, emotional disposition and personality. All these facets of the patient are examined and the medication is altered to suit. Homeopaths, like many modalities of alternative health, supports the theory that there is a vital force in each of us that, amongst other things, controls and energizes the body’s self healing ability to maintain an equilibrium of optimum health, spiritual strength and happiness. This vital force needs to stay in balance for the body and mind to function well. Ill-health happens when this equilibrium is disturbed and may manifest as symptoms in all or one of the body, mind and spirit. Dr. Hering was one of the first to make note of specific ways the healing progresses. He made three observations of the healing process which he asserted should be understood together as a unitary pattern, and homeopaths have dubbed his observations ‘Hering’s Law of Cure.’ First, he observed that the human body seeks to externalize disease – to dislodge it from more serious, internal levels to more superficial, external levels. Someone with asthma may develop an external skin rash as part of the curative process. Or someone with a headache may undergo a day or two of fever and sweating as a part of their cure. A person with emotional or mental symptoms may experience different and less serious emotional or mental problems or physical symptoms during their curative process. Hering’s second observation was that healing progresses from the top of the body to the bottom. Thus, a person with arthritis in many joints will generally notice relief in the upper part of the body before the lower part. An understanding of this aspect of healing helps homeopaths to differentiate true cures from temporary relief or placebo response. The third observation was that healing proceeds in reverse order of the appearance of symptoms. Thus, the most recent symptoms one has experienced generally will be the first to be healed. For this reason, in the process of cure a person may sometimes re-experience symptoms that he or she previously suffered from (generally those symptoms which were suppressed or never really healed). Although these old symptoms may be irritating, homeopaths will avoid suppressing them. They are usually only experienced for abrief time, and when they depart this time, the person usually experiences a significantly higher level of health. Hering’s laws are still the main guideline in following the development of the case. Hering was first to medically use nitroglycerin, some 30 years earlier, before it was begun to be used in classical medicine. Hering is responsible for greatly expanding the Materia medica of homeopathy and adding seven new categories of potentized remedies. At the same time, he was one of the true defenders of the four cardinal rules of Homoeopathy: similars cure similars, the single remedy, the minimal dose and the potentized remedy. The use of remedies made from miasmas (Nosodes). The use of potentized genus groups as curative and preventative remedies for individuals, groups, and habitats. Hering suggests potentized seed of weeds or dangerous plants to eradicate and destroy those plants and potentized insects or animals to remove and prevent infestations of dangerous species (Isodes). He was the author of a series of homeopathic works. He was a co-editor of the periodical Medical Correspondent (1835-36), Miscellanies of Homeopahy (1839), North American Homeopathic Quarterly (1851-52) and Homeopathic News (1864). He was also the founder and editor of the periodical Journal of Homeopathic Materia Medica. He also had written a number of books, both in German and in English, such as Rise and Progress of Homeopathy (1834), translated into several languages; The Homeopathist (1835-38), Condensed Materia Medica (1837), Effects of Snake Poison (1837), Domestic Physician (1851) and American Drug Provings (1863). 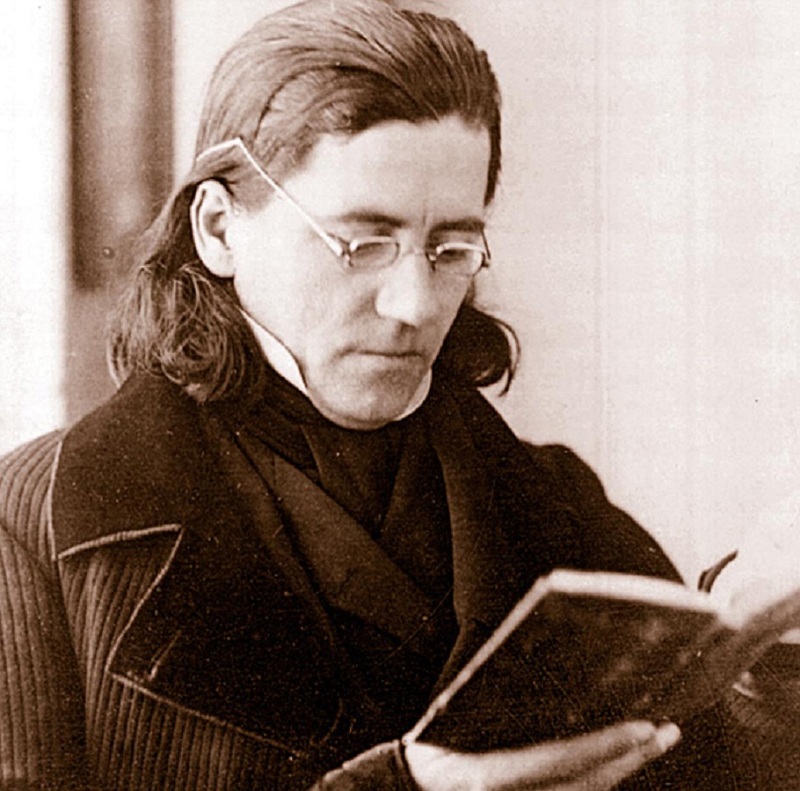 A year before he died, in 1879, Hering began assembling his extensive notes for his, to date popular, and unusually extensive book The Guiding Symptoms of our Materia Madica. His students completed it and posthumously published it in 1881. 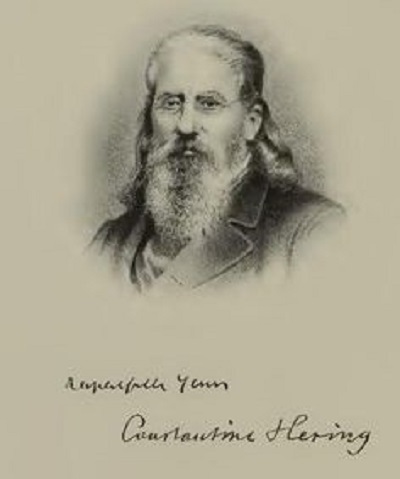 Constantine Hering died on June 23, 1880, at the age of 80 years. Hering’s father was a composer Carl Gottlieb Hering and his nephew, the physiologist Ewald Hering. Hering’s son Walter E Hering was the founder of the Globe Ticket Co., the oldest company for selling tickets in the US. The second son Rudolph Hering (1847-1923), a civil engineer by occupation, was considered a founder of modern environmental technology. The son of the latter, Oswald C, Hering (1874-1941) was a notable architect.